So this week, apparently, it was National Dog Day. My precious little kitty was a bit jealous that her brother was getting all the attention, so… being the princess that she is, she decided she needed to show the world her cute lil face today. I can’t complain, because, can you ever have too much cat? Mmmm nope. 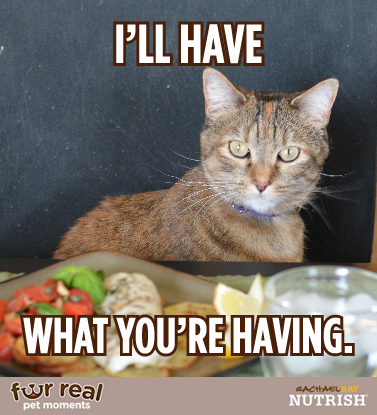 Today Cali wants to tell you guys about a really fun sweepstakes— you can win a year’s worth of pet food and $1500! And all you have to do? Meme your pet. A few months back, we started feeding Cali Rachael Ray’s Nutrish cat food. She’s a huge fan, and we’re big fans too because every Rachael Ray Nutrish food and treat recipe is made with simple ingredients like real meat and wholesome veggies, so they’re naturally delicious. 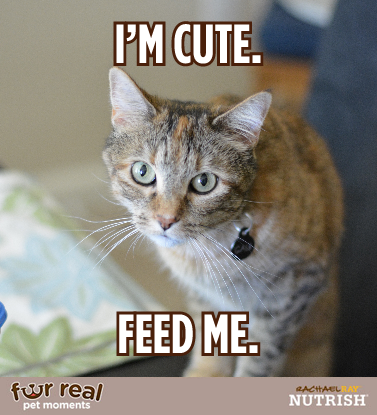 We feed ourselves well, and want to feed our furbabies well, too. Being the crazy cat lady that I am, everything revolves around my little muffin. There are times when you just know you’re a pet parent, right? Rachael Ray likes to call these “Fur Real Pet Moments.” The times when they’re being mischievous but you love them anyway. Like when Cali plops down for a nap right on top of a pile of clean laundry. Or when she gets the cat-crazies at 3 am and starts doing ninja moves off the walls. Or when she’s insistently begging for people food (she definitely knows the sound of the can opener and always assumes its tuna). It’s hard to be mad though, when they’re just so darn cute. And of course, we kind of encourage the behavior by giving in to her. You look so comfy! Stay snuggled up in there! Oh, you want some tuna? Here’s a little bite. She’s too hard to say no to. I’m always thinking about my little one. Last weekend we went out of town and found a cute little pet boutique. Of course I had to bring Cali home a gift. Really, I wanted to buy the whole store. But since I trip over her 400 toys on a daily basis, I restrained myself and just bought one. 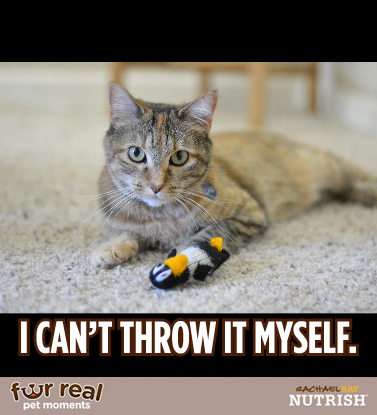 She got a new penguin catnip toy. She loved it. And then she got crazy. Reeeeeal crazy. Stressful days of sleeping, eating, and sleeping again… they can really take a toll. Sometimes you just gotta get nipped out and take the edge off. This time… she did a little too much nip. So, do you want to win a year’s worth of Nutrish pet food and $1500? It’s easy– and fun. You just have to meme your pet! Obviously, I had way too much fun with this. Seriously, I couldn’t stop. It’s kind of addicting and so much fun. Being a pet parent isn’t always easy. They chew on your good things, get into the garbage can, drink out of your glass and wake you up at some ridiculous hour just to say hi. But we love them anyways – and so does Nutrish! 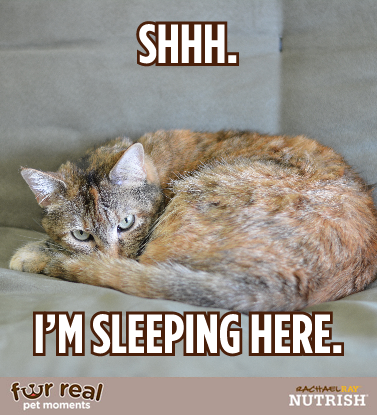 That’s why they want you to share your fur real pet moments for a chance to win. Upload a photo of your furry friend and choose a category and caption that fits for a chance to win. 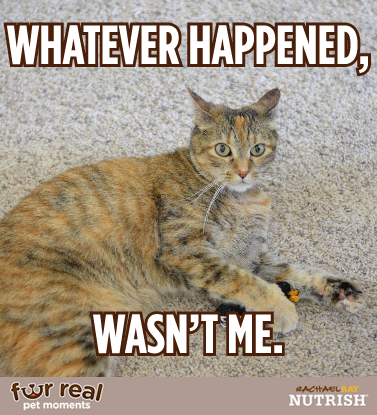 Go check out the “Fur Real Pet Moments” Meme Generator to enter! Not every pet can be as lucky as spoiled little Cali. But Nutrish is helping some of them! A portion of Rachael’s personal proceeds go to Rachael’s Rescue to help animals in need. Rachael’s Rescue was created for all of the forgotten pets — the ones that might not have someone who loves them as much as we love our pets. So hopefully one day they can wake up their loving moms with 3 am cat-crazies! This was such a darling, darling post!!! I loved it and I love Cali!! It was just adorable!!! Thanks, Caren!! Your furbabies are so cute, too! Jess, you should totally post about cats more often 🙂 I’m a huge cat lover and could look at kitty pictures all day! 🙂 Cute kitty! Oh my! I’m more of a dog person and because of my dogs I do not have any cats. It’s safer for the cats! This little furball looks like a lot of fun and excitement – even if it was National Dog Day!